“Now a bright new star is on the culinary horizon in the form of the Stone House. Billed as the place for 'wine, cheese and conversation'. The menu features an extensive, cutting edge wine and beer list that will transport you to faraway lands,” a Yelp review! The BEST place to hangout, Dance, Celebrate Weddings, Birthdays, Anniversaries and MORE! No matter what your reason, Eureka Live Underground is THE SPOT! 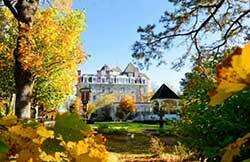 Enjoy a quaint and eclectic dining experience in the heart of Downtown Eureka Springs. Local Flavor Café offers fresh and creative dishes for Lunch, Dinner and Sunday Brunch. Delightful dining in a warm, friendly environment rich with art... Local Flavor Café has extensive wine offerings as well as cocktails to enhance your dining experience.